"What is the Holy Trinity?" What is the Holy Trinity? 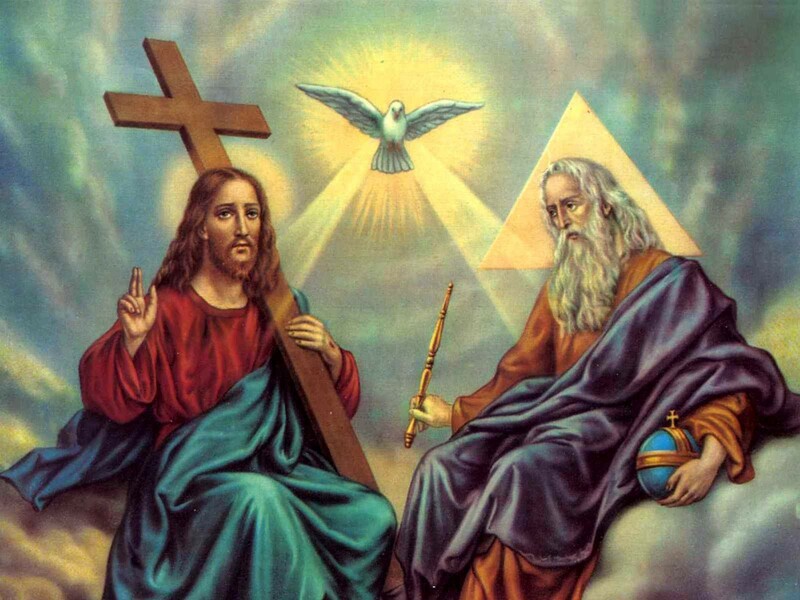 Trinity Sunday, officially called "The Solemnity of the Most Holy Trinity," is when we honor the eternal, triune God: the Father, the Son, and the Holy Spirit—one of the few feasts that commemorates a reality and doctrine. The Trinity is described as a "mystery," meaning it’s “a reality above our human comprehension.” It has been said that mystery is not a wall to run up against, but an ocean in which to swim. It wasn’t until Pope John XXII (1316-1334) that the Church established the feast—to be celebrated annually on the first Sunday after Pentecost. · 1. The Father actively and eternally generates the Son, constituting the person of God, the Father. · 2. The Son is passively generated of the Father, which constitutes the person of the Son. · 4. The Holy Spirit is passively spirated of the Father and the Son, constituting the person of the Holy Spirit. We should take note of the distinction between the "generative" procession that constitutes the Son, and the "spirative" procession that constitutes the Holy Spirit. As St. Thomas Aquinas explains, and Scripture reveals, the Son is uniquely "begotten" of the Father (John 3:16; 1:18). He is also said to proceed from the Father as "the Word" in John 1:1. This "generative" procession is one of "begetting," but not in the same way a human being "begets" a human being. This is an intellectual "begetting," as a "word" proceeds from the knower while, at the same time remaining in the knower. Thus, this procession or begetting of the Son occurs within the inner life of God. There are not "two beings" involved; rather, two Persons relationally distinct, while ever-remaining ONE in being. The Holy Spirit proceeds from the Father and the Son, but not in a generative sense; rather, in a spiration. "Spiration" comes from the Latin word for "spirit" or "breath." Jesus "breathed on them, and said to them, 'Receive the Holy Spirit...' " (John 20:22). Scripture reveals the Holy Spirit as pertaining to "God's love [that] has been poured into our hearts" (Romans 5:5), and as flowing out of and identified with the reciprocating love of the Father for the Son and the Son for the Father (John 15:26; Rev. 22:1-2). Thus, the Holy Spirit's procession has its origin in God's ultimate act of His will, which is love. The infinite act of love between the Father and Son is so perfect that "it" becomes a "He" in the third Person of the Blessed Trinity. God is not revealed to "be" love in any other religion in the world other than Christianity because in order for there to be love, there must be a beloved. From all eternity, the Father, Son, and Holy Spirit have poured themselves out into each other in an infinite act of love, which we, as Christians, are called to experience through faith and the sacraments (Romans 5:1-5). The Holy Spirit is depicted in Revelation 22:1-2 as a river of life flowing out from the Father and the Son, bringing life to all by way of bringing life to the very "Tree of Life" that is the source of eternal life in the Book of Revelation (Rev. 22:19). Biblically speaking, we see each of the Persons in God revealed distinctly and yet one in nature. For example, in John 17:5, our Lord prays: "...and now, Father, glorify me in your own presence with the glory which I had with you before the world was made." Notice, before the creation, the Son was “with” the Father. Yet, this relationship between two persons clearly has no beginning in time because it existed before creation—from all eternity. As far as nature is concerned, Jesus’ words from John 10:30 come to mind: “I and the Father are one,” in that they each possess the same infinite nature. The Holy Spirit is also seen to be relationally distinct from both the Father and the Son in Scripture inasmuch as both the Father and the Son are seen as “sending Him”: "But when the Counselor comes (the Holy Spirit), whom I shall send to you from the Father, He will bear witness of me…" (John 15:26) and "...He will guide you into all truth" (John 16:13). In fact, I Cor. 2:10 also reveals the Holy Spirit to be omniscient when it says, "... no one comprehends the thoughts of God except the Spirit of God." Thus, the Holy Spirit is revealed in Scripture to possess the same infinite and divine nature as does the Father and the Son.